We are looking for new talent, willing to join a team approach, work hard, enjoy fresh air and likes to work with people. Tired of serving up stale food, pushy customers and a work environment that is pushed or be pushed? We have limited openings at the garden center, but you have to believe in our values and fit our family style approach to business. We like working with each other, and a team interview allows this opportunity. The right person will be strong, able to lift trees in a single hand, load piles of manure into expensive luxury sedans and love to hang with really cool gardeners we call customers. If you don’t have a sense of humor or enjoy meeting new people on a daily basis, there is no need to apply, don’t waste our time or yours. This is a driving position; you might be asked to go to customers gardens and deliver plants, may be called on to learn how to plant for success. 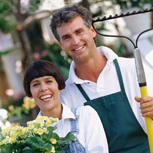 You will be a garden pro after the spring season. Make sure you have a clean driving record because we do check the background of all new team members and drug test everyone, I mean everyone. Here’s what we believe, if you like what we like, then please apply, ASAP. These positions go FAST. We pay well above the minimum, but way more important than the money, we like and support each other. If you are a loner, don’t apply, if it’s only about the money, don’t apply, if you don’t like great customers service, your colleagues or people in general then for the sake of gardening don’t apply! WE DON’T WORK NIGHTS. We are in retail and open seven days a week, but super flexible and can work with students, parents and those with complicated lives, we just have to get the work done by the end of the day. You will be home for breakfast and dinner each day, even on the busiest days. If you like to garden, all the plants are at wholesale cost if hired, or close to it. We want you to learn how to garden at Watters Garden Center and give you an incentive to try something new in your gardens. We are a business of values, passion, integrity, community, and beliefs. If you truly believe the following, you are halfway there and we encourage you to apply this week.